Elise Luttik presented at the Milan Design Week with Dutch Satellite at the SaloneSatellite in Rho, Milan. As the instant production method 3D printing was the quickest way to fulfil her promise, Luttik’s first designs are small white items like the Little Rabbit webcam cover and coaster Cookie. In Milan she’ll launch the Upside Down collection, a complete interior concept consisting of the Upside Down Chair, Upside Down Table and the Upside Down Lamp. Upside Down Chair is a lounge chair that offers a safe place to sit while it embraces your back. Place the chair upside down to turn it into a throne, a pedestal to sit on that allows better views from a royal perspective. Upside Down chair is cut out of 2 boards from the same ash tree, sourced locally in The Netherlands. Elise makes the nerves and veins of the wood stand out and tells the story of years of growing. “It is the tree that determines which pieces with wood nerves have enough strength to become those slender legs, and which part has the most interesting pattern for the seat bottom.” The Upside Down Table follows the same idea and style to complete the sitting arrangement as a table, or turn it into a basket to store magazines or other belongings. Upside Down Lamp sheds a light on the set and might just help you have that ‘eureka’-idea you have been waiting for. 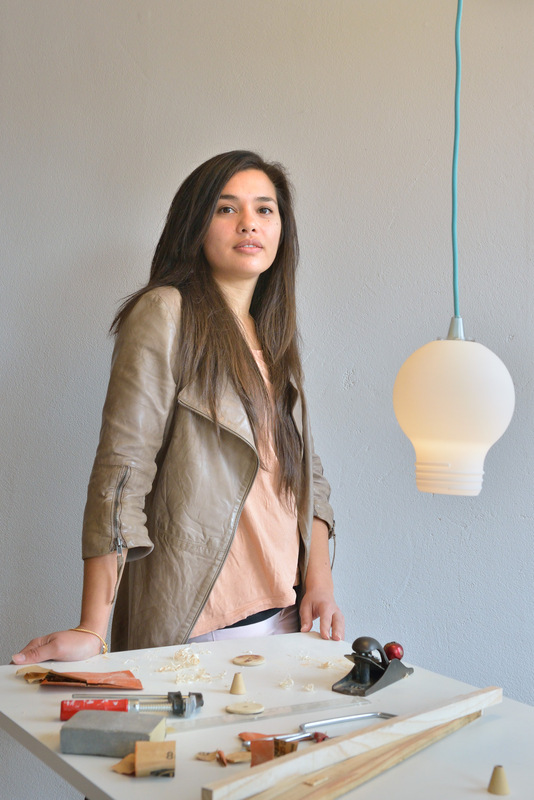 As a Master in Product Design, her work always features well considered technology and construction, like the slender steam shaped wooden legs of the chair and the laser sintered light bulb. The presentation is supported by the Consulate General of the Kingdom of the Netherlands in Milan.